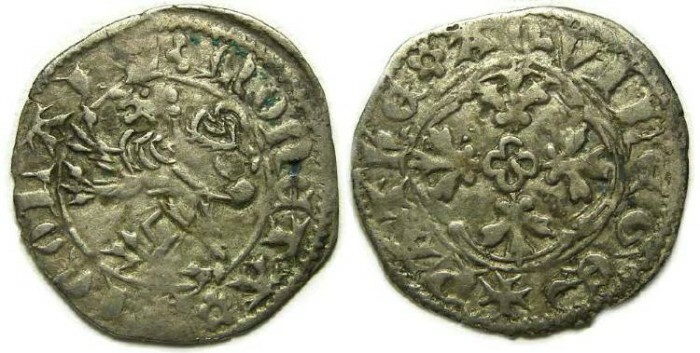 Denomination : Silver Denaro. Mint : Aquilea. Date : AD 1350 to 1358. Reference : Biaggi 178, Thomsen 1972. Size : 18.5 x 19.3 mm. Weight : 0.65 grams. Obverse : Crowned lion standing right, with MONETA NICOLAI around. Reverse : Cross of flowers, with a quadrifoil in the center, with PAThE AQUILE GE around (note that the image of the reverse is upside down).